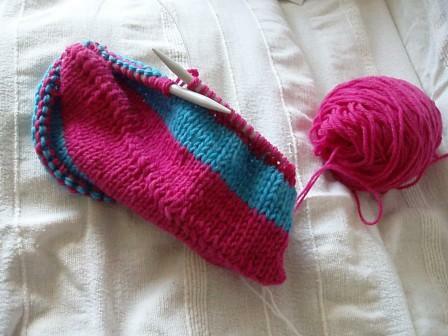 I have finishing knitting my Noni bag (above picture is of the work in progress). I am really nervous now since it is in the washing machine being “felted”. This is the first time I have done this and despite checking on the Internet I have not been able to find concrete instructions on how to do it – they are generally quite vague: hot wash, short cycle, keep checking (how can I do this??) so I have set my front loaded washing machine on to 50deg on a colour wash cycle (this is D on my machine), I’ve set the spin to 400 (instead of the 1200 that I usually have it on) and on a half load. Hopefully the resulting bag and strap will come out ok or at least under felted so I can try again. I do hope this works out since I plan to give the bag to my niece as a birthday present. Fortunately her birthday isn’t until May so at least I have some time to work on something else if it goes pear-shaped!